IESE Insight Stealth takeovers: are hidden shareholders buying your company? Stealth takeovers: are hidden shareholders buying your company? In 2014, luxury firms LVMH Moët Hennessy Louis Vuitton and Hermès signed a truce, ending a long and arduous battle popularly known as the "handbag war." The melee erupted in October 2010, when the fashion giant controlled by Bernard Arnault disclosed it had amassed a 17 percent stake in Hermès, which would eventually grow to over 22 percent. LVMH had acquired a significant percentage of Hermès without anyone noticing. Instead of buying shares outright, it opted for equity derivatives, which did not require the shareholder to declare its position. Such takeover strategies are known as creeping acquisitions or stealth takeovers. Many consider such maneuvers a surreptitious and sometimes illicit way to take control of another company, and call for greater transparency and a limit on such practices, which can be done through different mechanisms, such as equity swaps. In contrast, there are others who caution against the potential negative effects of excessive regulation of the mergers and acquisitions (M&A) market. An efficient and dynamic M&A market has been linked with more optimal performances from publicly traded companies. The late American scholar Henry G. Manne called a hostile takeover bid "the most powerful market tool ever devised for dealing with non-profit-maximizing managers in publicly held companies." If current management is failing or ineffective, shareholders and board members can take control to relieve the management team of its duties and make the firm more efficient in an active takeover market. Moreover, M&A activity can promote a better use of capital and a more accurate valuation of companies. Economic benefits have been shown by several studies, such as the one by IESE professor Stefano Sacchetto, which concludes that an active M&A market can increase aggregate economic productivity by nearly 5 percent -- tallying up direct productivity gains in merging firms and indirect effects, too. But to protect the interests of shareholders and ensure some stability in management, the takeover markets of the world have been regulated for decades. There are disclosure requirements, included in the groundbreaking Williams Act, adopted by the United States in 1968. European laws have similarly regulated takeover bids, adding disclosure requirements. Takeover mechanisms should be regulated, to some extent, to protect shareholders' interests. But regulators should be careful with their reach, because they could end up inhibiting activity. Even something as commendable as establishing requirements to promote transparency in deals can have unintended, and undesirable, effects. That is what may have happened with the application of the EU's 2004 Transparency Directive, a regulation that imposed tighter disclosure requirements regarding the financial and ownership information provided by European public firms. IESE's Pietro Bonetti, Miguel Duro and Gaizka Ormazábal cover this in the article "Disclosure Regulation and Corporate Acquisitions," in which they analyze the impact of disclosure regulations and the demands of greater financial transparency on the M&A market. Specifically, the authors ask whether the obligation to disclose certain information can raise acquisition costs and thus discourage takeovers. To answer this question, they study the effects of the EU's Transparency Directive (TPD) not only in relation to the financial information required periodically, but also in regard to the information shareholders must disclose about their participation in a particular company, whether direct or through financial instruments, such as equity swaps or other equity derivatives. The research confirms that this directive was followed by a significant drop in M&A activity. This decline was particularly sharp in the European countries with more dynamic takeover markets. The authors posit that this decline was not due to the financial crisis for two reasons. First, the decline was only seen in public companies, the only ones subject to the regulation. And second, because in 2013 there was an additional drop-off coinciding with the tightening of the directive. 1. Stock returns of the target companies were higher after the directive. In other words, the acquisition premiums increased. 2. Stock returns of the acquiring companies were lower after the directive. 3. Bidder toeholds were smaller after the directive. That is to say, potential buyers had smaller stakes in their targets before announcing their takeover attempts. From this, it could be inferred that, under the new regulations, stealth takeovers or creeping acquisitions were harder to pull off. In sum, takeover activity decreased under this disclosure regulation, especially in more dynamic M&A markets, but we can't categorically conclude that it has had a negative effect overall. 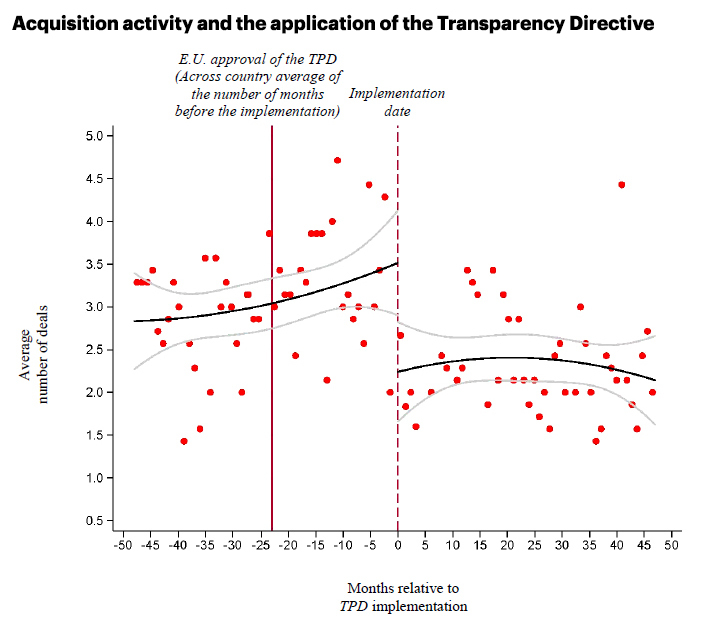 It could be that the Transparency Directive stopped the stealth takeovers that were socially suboptimal, perhaps because they were driven by interests other than economic efficiency or boosting productivity. 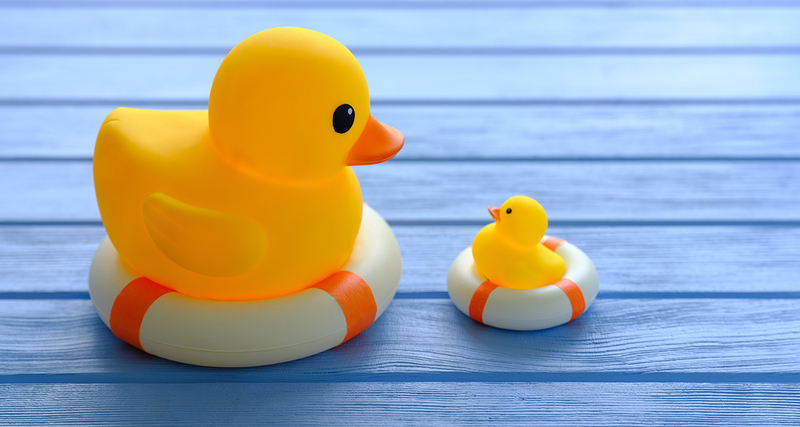 In any case, an active MA&A market tends to be beneficial from an economic and productivity point of view, so it's worth watching closely if regulations slow it down.